Who's going to be drinking champagne, and who's got an earlier tee time? 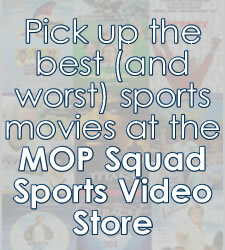 Talk some trash, hear some rumors, spend a little time in the MOP Squad Sports Forum. Copyright ï½© 2007 MOP Squad Sports & www.mopsquad.com. All rights reserved. This website is an unofficial and independently operated source of news and information not affiliated with any school, team, or league.